John Ignatius Armstrong, ‘the golden barman’, was born on 10 July 1908 to Irish parents, William, and Ellen, née Hannan. His father had hailed from Tipperary and his mother from County Cork. At the time of John’s birth the Armstrong family, already numbering six children, were living in the ‘Butchers Arms’ (later the ‘Dunkirk’), the family hotel in the inner Sydney area of Pyrmont. Armstrong was educated at St Bede’s School, Pyrmont, and at Marist Brothers’ High School, Darlinghurst. A keen sportsman, he was a boxing champion of metropolitan Catholic schools and later a bowler and golfer. He started work as a barman at the Butchers Arms as soon as he left school. On 25 October 1945, he married, at the Church of the Holy Family, Lindfield, Joan Therese Josephine Curran, a secretary, and sister of a Sydney stockbroker. The couple would raise a family of four daughters and a son. This background does much to account for Armstrong’s values and his strong political base within the inner city Labor Party, which he joined at the age of twenty-one. He quickly became president of the Pyrmont branch of the West Sydney Federal Electoral Council, as well as delegate to the Labor Party’s annual conferences. In the early 1930s he was a member of the winning team in the Labor Daily’s debating competition. By 1937 Armstrong was one of Labor’s ‘Four A’s’—Ashley, Arthur, Armstrong and Amour for the Senate. The rank and file preselection ballot, in which it was claimed 40 000 voters had participated, caused some factional discontent, but all four went on to win the election. In the campaign, Armstrong played an active role, travelling ‘from Labour League to Labour League’ as ‘the man with the A’, and accompanying J. A. Beasley, MHR, director of the New South Wales campaign, on a state-wide tour. He would later prove to be an effective fund-raiser for Labor. Not yet thirty, Armstrong began his Senate career on 1 July 1938. He was promptly appointed to the Senate’s Standing Committee on Regulations and Ordinances (1938–40) and as a member of the Senate Committee of Disputed Returns and Qualifications (1938–46). In his first speech he drew attention to the conditions in his own locality—he said there were now more callers at the homes of members of Parliament in metropolitan Sydney than at any time since the Depression. In other speeches, he advocated measures to encourage larger Australian families rather than relying on immigration. He was especially critical of companies like BHP which looked overseas to fill important positions and which purchased ships from the British, even though capable Australian tradesmen were anxious for the work. 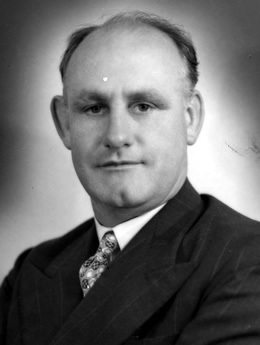 For a time Armstrong’s career was on hold when he joined Lang’s breakaway Labor Party (Non-Communist) in April 1940. He rejoined Caucus in March 1941 after ‘unity’ was restored and the group was readmitted, and contributed to Labor’s vigorous attack on the adequacy of Australia’s war preparations. With Labor in power, in May 1942 Prime Minister John Curtin appointed Armstrong to the Commonwealth Rationing Commission. This body implemented an effective system of rationing for clothing, tea, sugar, butter and meats. In 1941 Armstrong became a member of the Joint Committee on Profits and also the Library Committee, remaining on the latter until 1946. From 1945 (to 1949) he was government representative on the National Film Board where he furthered the use of publishing and film to portray Australia’s war effort. He raised the importance of the film industry in estimates debates, promoted the establishment of a Commonwealth film unit as essential and proposed a scheme to send ‘young men’ to the United States to write about Australia for an American audience. Further recognition came in November 1946 when Armstrong was appointed Minister for Munitions. In this role he assisted with Council of Defence postwar planning. In April 1948 he became Minister for Supply and Development. In these posts he revealed an administrative capacity, and strong interests in the development of Australian industries and in war service housing. Reassured by postwar reconstruction and full employment policies, Armstrong supported the expanded but still selective immigration program of Australia’s first Minister for Immigration, A. A. Calwell. He represented the Minister in the Senate, and in June 1947 was Acting Minister for a short time, accompanying Calwell to Berlin in July 1947. In July 1949 he introduced into the Senate Calwell’s controversial Immigration Bill and War-time Refugees Removal Bill, both designed to remove uncertainties regarding the scope of the federal power to deport immigrants, raised by the High Court case of O’Keefe v. Calwell. Despite a solid administrative record Armstrong was not always politically discreet. On 3 July 1946 he criticised in the Senate the decision of H. V. Evatt, as external affairs minister, to investigate whether Spain constituted a possible danger to peace, recommending, during the course of the debate, the establishment of a foreign affairs committee. In October 1948 Chifley had to defend Armstrong’s suitability as Minister in Charge of the Royal Tour. There were extra-sensitive complaints that he had disparaged Britain by telling a New York audience that Australia needed those qualities which had built New York but which seemed lacking in the English. In opposition after 1949, Armstrong served on the Joint Committee on the Australian Capital Territory (1959–61). He visualised a Canberra that included an industrial element as well as a public service, and considered that the Australian Capital Territory had already reached the stage where its elected representative should have full voting rights in the federal Parliament. His situation now permitted more attention to his business ‘empire’. He and his family held shares in many companies including Pioneer Holdings (soft goods) and Strong-Lite Aluminium Industries. He was a director of the Greater Union Theatre Group, chairman of Metropolitan Theatres and Investment Company, National Properties, Nile Textiles and later, Sydney Wide Discount Stores. He was also part of a syndicate searching for uranium, and in the Senate supported the development of atomic energy for defence purposes. In 1946 he had warned that Australia could be wiped out unless its population was increased tenfold and advocated the sharing of military bases with the United States. ‘We must’, he said, ‘be in a position to manufacture in this country the very latest instruments and weapons whether they be associated with atomic developments, or the development of rocket or jet-propelled aircraft, or special units of artillery’. Armstrong’s business interests made him a target for left-wing criticism. In 1952 he commented that Australian industries were being outpriced because of rising internal costs. His advice that Australians should move into South-East Asia was not a welcome suggestion, although Caucus was subsequently reported to have accepted an explanation of his intended meaning. His Cold War stance also aroused concerns. In 1953 he warned that well-meaning people were being hoodwinked by the peace movement. He sought reassurance that the Government was prepared to deal with the proposed Australian convention on peace and war if it proved subversive. After visiting anti-communist leaders in South-East Asia in 1951, he was accused of acting as a lobbyist for Nationalist China. In 1955 the Century claimed that Armstrong had implied, when addressing a rally of industrial groups (anti-communist cells within the ALP), that Australia should fight to maintain Nationalist control in Taiwan. In October 1954 Armstrong, with some reluctance, had voted, with Calwell, against the Leader of the Opposition, H. V. Evatt, at what has been described as ‘probably the most acrimonious meeting’ in the history of Caucus. Evatt’s claim of subversion within the ALP at the instigation of an outside ‘Movement’ (with the implication that this was the Catholic Social Studies Movement) had led to a call for a spill of positions. Armstrong, who from 1951 was Deputy Leader of the Opposition in the Senate, later denied allegations that he was associated with the ‘Movement’. While his factional differences did not produce lasting personal antagonism, his political future was harmed by his sympathy with the values of the industrial groups, even though he disagreed with their hardliners’ later decision to break away from Labor. In October 1955 Armstrong almost lost Senate preselection, following a struggle between the groupers, headed by himself, and the pro-Evatt team, headed by Senator Ashley. After apparent irregularities in the ballot (which Armstrong’s team was losing) Labor’s state executive made a compromise selection in which Armstrong was given the safe second position behind Senator Ashley. In February of the following year Armstrong lost his position as Deputy Leader of the Senate, and in May 1960 was clear fourth in a Senate preselection ballot when 140 delegates selected three pro-Evatt candidates, J. F. Fitzgerald, L. K. Murphy and D. M. McClelland from forty-two candidates. When his Senate term ended in June 1962 Armstrong sought preselection as Labor candidate for Lord Mayor of Sydney. Despite a vigorous campaign, he lost to the sitting candidate, H. F. Jensen, and instead became chairman of the Sydney County Council (1963–65). In December 1965 he was elected Lord Mayor, fulfilling one of his ‘life ambitions’ as he gained 66 per cent of the vote. Unfortunately for Armstrong, Premier Askin’s new Liberal Government in New South Wales dismissed the council in 1967 and placed it under the control of a city commission. When the council was restored in 1969, with reduced boundaries and a new electoral system, the Civic Reform Group won twelve of the twenty positions. Since the Lord Mayor was now chosen by councillors, that ended Armstrong’s hopes. Nevertheless, in December 1972, he attained a final ambition in his long public career. Following the example of his political mentor, J. A. Beasley, he became Australian High Commissioner in London. (In 1943 he had been a delegate to the British Empire Parliamentary Association, and in 1961 representative to the Council of the Inter-Parliamentary Union in Geneva.) His appointment by the Government of Gough Whitlam was a symbolic change. A genial host, with great personal charm and a much admired collection of Australian art, Armstrong opened up a formerly stuffy Australia House. Over his two-year term he became a very popular High Commissioner. Whitlam, once Armstrong’s factional opponent, summed him up as an accomplished representative who ‘embellished Australia House’. Armstrong was pleased to return to Australia in 1975. He had, he said, been dreaming of Collaroy Beach and ‘shorts and thongs’. As he left England he reiterated his belief in Australia’s independence. ‘[The British] accept that the child has grown up’, he told reporters, adding that it would be ‘an ordinary historical development’ for Australia to become a republic. His earlier warnings on the inevitability of such an occurrence had led to an editorial in The Times. Having advocated an Australian honours system as a member of the Chifley Government, Armstrong also did the groundwork in London to facilitate the introduction of Whitlam’s Order of Australia scheme. Fittingly, he was made a Companion of the Order in 1977. He died on 10 March, the day following his investiture, at the New South Wales holiday resort of Bateman’s Bay. After a Requiem Mass at St Mary’s Cathedral, Sydney, and a state funeral, he was buried at the Northern Suburbs Cemetery. His wife, daughters, Catherine, Mary Ann, Patricia and Margaret, and son John survived him. SMH, 11 Mar. 1977, p. 4; The transcript of an interview between Armstrong and Mel Pratt, 11–12 Nov. 1975, TRC 121/68, NLA, has been used throughout this entry; Edmund Campion, ‘Armstrong, John Ignatius’, ADB, vol. 13; Michael R. Matthews, Pyrmont and Ultimo: A History, Pyrmont Ultimo History Project, Ultimo, NSW, 1982, pp. 42, 49, 95–7; Don Whitington, Ring the Bells: A Dictionary of Federal Politics, Georgian House, Melbourne, 1956, pp. 5–6; SMH, 24 Feb. 1942, p. 6, 5 Nov. 1934, p. 9. Whitington, Ring the Bells, p. 1; Sun (Syd. ), 9 Mar. 1954, p. 18. CPD, 27 Sept. 1938, pp. 231–5, 12 Oct. 1938, pp. 593–9, 30 Nov. 1938, pp. 2319–25. John Faulkner and Stuart Macintyre (eds), True Believers: The Story of the Federal Parliamentary Labor Party, Allen & Unwin, Crows Nest, NSW, 2001, pp. 71, 73, 76, 266; Patrick Weller (ed. ), Caucus Minutes 1901–1949, vol. 3, MUP, Carlton, Vic., 1975, pp. 258–9; CPD, 8 Dec. 1939, pp. 2536–8, 14 May 1942, p. 1269, 24 Sept. 1942, pp. 842–50. CPP, Joint Committee on Profits, reports, 1941, 1942; CPD, 20 Sept. 1944, pp. 1046–7, 28 Feb. 1945, p. 135, 27 Nov. 1946, pp. 594–5; W. J. Hudson and Wendy Way (eds), Australia and the Postwar World: Documents 1947, AGPS, Canberra, 1995, p. 299; CPD, 6 May 1948, pp. 1503–4, 28 June 1949, pp. 1535–7, 7 Apr. 1948, p. 577. Hudson and Way, Australia and the Postwar World: Documents 1947, pp. 493–4; SMH, 21 June 1947, p. 12; CPD, 6 July 1949, pp. 1995–2003; In December 1949, the High Court upheld the constitutional validity of both laws, see Koon Wing Lau v. Calwell (1949) 80 CLR 533; Colm Kiernan, Calwell: A Personal and Political Biography, Nelson, West Melbourne, Vic., 1978, pp. 139–47. CPD, 3 July 1946, pp. 2076–82, 26 Oct. 1948, p. 2067; SMH, 27 Oct. 1948, p. 3, 10 Mar. 1948, p. 1. CPP, Joint Committee on the Australian Capital Territory, reports, 1959; CPD, 6 May 1959, p. 1243; Century (Hurstville), 15 Apr. 1955, p. 3; CPD, 19 Mar. 1958, pp. 247–50, 3 June 1952, pp. 1191–4, 1211–12, 3 July 1946, pp. 2080–1. CPD, 30 Sept. 1952, pp. 2272–83; Sun-Herald (Syd. ), 22 Feb. 1955, p. 19; Daily Mirror (Syd. ), 22 Oct. 1952, p. 23; CPD, 10 Sept. 1953, p. 35, 9 Sept. 1953, p. 12; Century (Hurstville), 25 Feb. 1955, p. 5. Faulkner and Macintyre, True Believers, pp. 213–15; SMH, 21 Oct. 1954, p. 1, 15 Dec. 1954, p. 1, 16 Dec. 1954, p. 4; Robert Murray, The Split: Australian Labor in the Fifties, Cheshire, Melbourne, 1970, pp. 179–81, 192–3. SMH, 27 Sept. 1955, p. 4; Murray, The Split, pp. 291–2; Patrick Weller and Beverley Lloyd (eds), Federal Executive Minutes 1915–1955, MUP, Carlton, Vic., 1978, pp. 636–8; SMH, 29 Oct. 1955, p. 5, 31 Oct. 1955, p. 2, 15 Feb. 1956, p. 3; Sun-Herald (Syd. ), 1 May 1960, p. 2. SMH, 4 Aug. 1962, p. 1, 30 Jan. 1963, p. 1, 29 June 1965, p. 5, 6 Dec. 1965, p. 4; F. A. Larcombe, The Advancement of Local Government in New South Wales 1906 to the Present, SUP, Sydney, 1978, p. 145; SMH, 29 Sept. 1969, p. 1. Age (Melb. ), 24 Mar. 1973, p. 13; CPD, 30 Sept. 1943, p. 203, 9 May 1961, pp. 814–16; SMH, 22 Feb. 1975, p. 11, 13 Dec. 1972, pp. 1–2; DT (Syd. ), 1 Mar. 1975, p. 9; CPD, 15 Mar. 1977 (R), pp. 171–2. SMH, 22 Feb. 1975, p. 11; The Times (Lond. ), 14 Dec. 1972, pp. 9, 17; DT (Syd. ), 1 Mar. 1975, p. 9; CPD, 15 Mar. 1977, pp. 111–14; DT (Syd. ), 11 Mar. 1977, p. 1; CT, 12 Mar. 1977, p. 7. This biography was first published in The Biographical Dictionary of the Australian Senate, vol. 2, 1929-1962, Melbourne University Press, Carlton, Vic., 2004, pp. 439-443.